While Patricio Guzmán’s documentary Nostalgia for the Light juxtaposes fairly niche interests – astronomy and the Pinochet era – the poetic way he draws parallels between scientific and sociopolitical investigations of the past transcends the particulars. Personal traumas resonate on an epic scale in Guzman’s haunting depiction of the scars of modern Chile. Forty years ago, Chile’s democracy was struggling with a crippled economy and a politically polarised population. Four decades of strong leftist forces were being challenged, especially because of the Cold War. Under these conditions, hard right General Pinochet staged a successful, military coup against the leftist president Salvador Allende. His regime aggressively and brutally silenced any opposition, imprisoning, torturing, ‘disappearing’ and exiling thousands – including Patricio Guzmán. When Guzmán was 32, he started his second documentary called The Battle of Chile, filming up until the day of the coup that put Pinochet in power. On that day, Guzmán was imprisoned for two weeks. Then, threatened with execution, he fled to Europe with his film stock. Since that time, he has made many documentaries about Chilean concerns, and it is fitting that – now in his 70s – he reflects upon Chile’s history with a pained nostalgia. 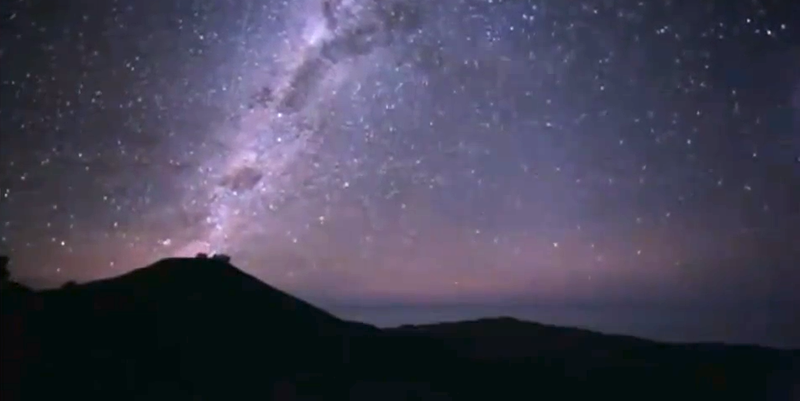 The film is dominated by gorgeous, sweeping shots of the Atacama desert and the glittering sky above it. Guzmán shows us how both environments grant us access to evidence of the past, whether through the changing composition of star systems or through preserved artefacts shallowly buried in shifting sands. He also captures how time is pre-modern in these environments, and the present feels like a fallacy. Even the sunlight we see and feel takes eight minutes to travel to us. He makes it clear that the silence of the desert and of space doesn’t necessarily indicate calm – both are pregnant with secrets and history that lead to endless questions. To try and answer these questions, Guzmán interweaves varied testimonials from Chileans with these images of nature, effectively layered to ruminate upon how we try to find inner peace by remembering and trying to understand our past. He is fascinated by Chile’s paradoxical predisposition to examine the ancient past through the sky and the desert, while seeming to have a collective amnesia about the recent past. His most heartbreaking interviews are with women who have been tirelessly searching the Atacama desert for the remains of their loved ones for nearly three decades. Their struggles embody the film’s title – they, representative of many Chileans, long for a time when they did not feel like they live restlessly in the dark, isolated in their search for answers. But ultimately, by focusing on this intersection of history and science, Guzmán’s unique documentary tries to reassure us by emphasising the invisible interconnectedness of everything. It serves as a reminder that we’re part of a massive cycle, made of stardust, and generation after generation will continue to pursue an understanding of it all. Nostalgia for the Light is in cinemas now. Follow contributor Cathy Landicho on Twitter @ConfusedAmateur. This entry was posted in Reviews and tagged astronomy, chile, documentary, film, moving, Nostalgia For The Light, Patricio Guzman, pinochet, review on August 2, 2012 by Cath L.